Hot school meals are prepared by Cygnet Catering in our school kitchen. A school lunch represents excellent value for money and currently costs £2.35 per day (£11.75 for the week). Cygnet Catering (Chartwells) operate an online ordering system for school meals. MEALS MUST BE ORDERED NO LATER THAN MIDNIGHT ON TUESDAY FOR THE FOLLOWING WEEK. Please see the link below for the ParentPay system, if you require an activation code letter please contact the school office. If you think your child is entitled to a free meal, please ask for a Free School Meals form at the school office. Children in Foundation 2 and Years 1 and 2 are now offered free meals under the Universal Free School Meals initiative. However, if you receive qualifying benefits YOU SHOULD STILL APPLY FOR FREE SCHOOL MEALS regardless of your child’s year group. Children can also bring their own cold packed lunch if they wish. Please do not send glass bottles or cans. We would urge you most strongly to pack a healthy lunch box which avoids sandwiches containing jam or chocolate spread, and include a piece of fruit and a healthy snack bar. We have an excellent team of Midday Supervisors who help children during lunchtimes and supervise their play. Foundation 1 and 2 children will be provided with fruit and milk. 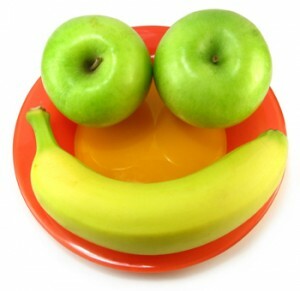 Year 1 and 2 children will be provided with fresh fruit each day for eating during their morning break. All pupils can opt to have milk at first break time at a cost of 22p per day (free in some circumstances). Please ask at the school office or click on the Cool Milk link below. We do not allow children to have sweets, chocolates or crisps. Children are encouraged to bring their own bottle of water each day. Once in Key Stage 2 free fruit is not provided but children may bring a healthy snack. Some of the following links may be helpful to parents or inspire them regarding healthy eating and also provide useful nutritional information about different foods.